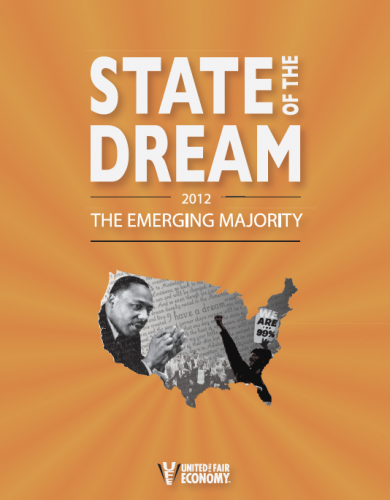 State of the Dream 2012: The Emerging Majority co-authors Wanjiku Mwangi and Tim Sullivan have an in-depth discussion of the report with WBAI Pacifica "Talk Back!" host Hugh Hamilton on his Martin Luther King, Jr. Day broadcast and fundraising drive. 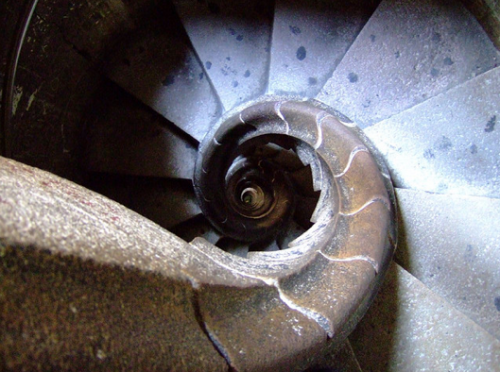 UFE and WBAI are partnering to offer the report as a complimentary gift to the first 100 listeners to pledge $50 or more toward WBAI's work to "foster understanding amongst nations and individuals, encourage creativity, and promote innovative, uncensored distribution of news." Visit WBAI.org to pledge your support. 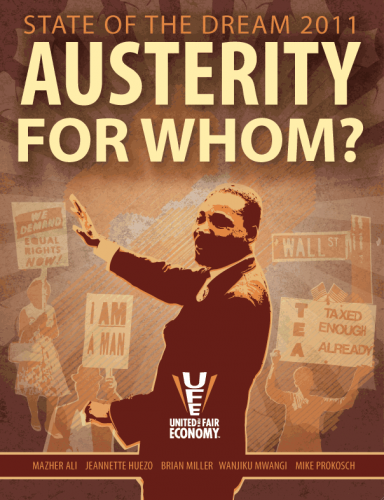 UFE's ninth annual Martin Luther King, Jr. Day report assesses the current racial economic divide and offers a glimpse at a future that could be. Its findings should prompt people of all races and walks of life to unite in action for a more just and racially equitable future. This timely publication is being covered online, in print and in broadcast media. The links below are a sampling, and the list will be updated as new coverage emerges. If you are a member of the media or a blogger on social and economic issues and would like to schedule an interview with a co-author or spokesperson for the report, please contact Maz Ali at 617-423-2148 x101 and/or mali@faireconomy.org. 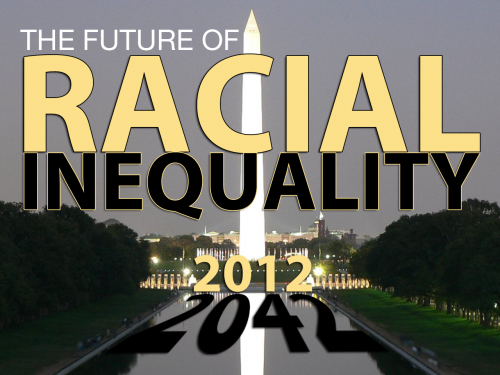 1/15/2012 Inequality.org A Financial Nest Egg for Every American Baby? 1/15/2012 The Daily World Remembering Marting Luther King, Jr.
For as long as unemployment data by race have been collected (about 39 years), black unemployment has been roughly double that of whites. Today, the black unemployment rate is an alarming 16 percent. If discouraged workers are included, that number would be much higher. The causes of disproportionate unemployment in the black community are many and varied, but economists believe that the main three are the lingering effects of discrimination, the educational attainment gap and economic segregation. The erosion of manufacturing jobs in recent decades, coupled with the anti-government attack on public-sector jobs, have worked together to exacerbate these historical inequalities. The Center for Economic and Policy Research estimates that between 1979 and 2007, manufacturing jobs held by blacks fell from 23.9 percent to 9.8 percent. The auto industry, for example, has had above-average employment for blacks for a long time, but it has crumbled, meaning that the loss of jobs has been devastating for that community. Similarly, the assault on public-sector workers — teachers, social workers, food inspectors and more — has a clear racial impact. 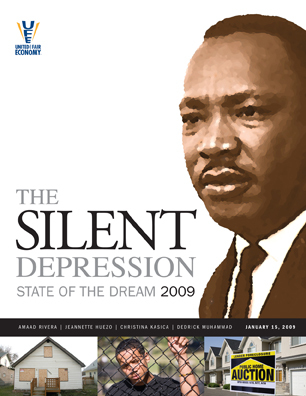 United for a Fair Economy’s 2011 State of the Dream report notes that blacks are 30 percent more likely than the overall workforce to hold public-sector jobs, and 70 percent more likely to work for the federal government. Unemployment levels experienced in the black community continue to concentrate high levels of poverty in already-struggling communities, which has profound social effects in perpetuating a downward spiral of crisis. Children growing up here are exposed to high rates of crime and violence, to low-quality foods, and to some of the worst-performing schools, with a lasting impact throughout their lives. Policymakers in Washington must take bold action to break this cycle. Leaders need to target job creation and retraining strategies in communities hardest hit by the Great Recession. Targeting job creation strategies will help lift struggling black communities in ways that the “shovel-ready” focus of previous job creation efforts cannot. That’s one reason the Congressional Black Caucus in 2009 called for more job creation funding for economically distressed communities. As unpalatable as it is to the austerity mindset in Congress, increased federal government spending is necessary to keep people working, including black Americans. This op-ed was originally published in the Atlanta Journal Constitution on October 25, 2011. The relentless focus on federal budget-cutting has burned up so much of the country's political oxygen that it nearly choked off dialogue on a more immediate, urgent concern: poverty. 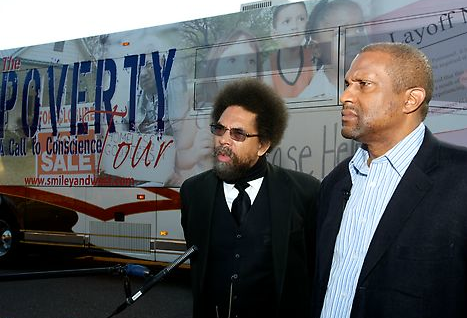 The instigators of the bus tour, PBS talk show host Tavis Smiley and Princeton professor Cornel West, did the nation a favor by turning the spotlight onto the very real needs of poor Americans. They feel "invisible" and "disposable," Smiley said during the tour, which ran from Minnesota to Memphis, Tenn. The sentiment is not surprising. The poor have been left behind by what little economic recovery there has been since the 2008 crash. And in Washington's deficit-obsessed political climate, the talk is all about slashing government — not poverty rates. [T]he "Call to Conscience" tour was constructive because it pushed the problem of poverty back into the center of a national conversation that had been hijacked by fiscal hawks who see only the cost, not the value, of government. Unlike the abstractions of long-term deficit projections, poverty is a tangible, here-and-now reality. The country waged a "war on poverty" in the 1960s, but the problem — fed by structural changes in the U.S. economy, policy choices, social shifts and other factors — grew in ensuing decades. 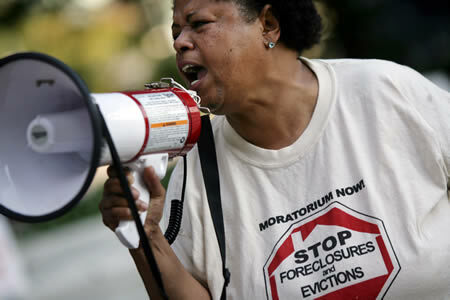 Unfair mortgage practices and the epic recession triggered in 2008 exacerbated the trend, wiping out years of progress. Today, disparities in income, educational attainment, home ownership and family wealth are growing. The rich are getting richer, while the ranks of the poor are poised to expand as government shrinks and job creation remains stagnant. The employment cuts are likely to have an outsized effect on minority communities, according to the group United for a Fair Economy's "State of the Dream 2011" report. The federal government is an important source of employment for blacks, data indicate. Rich vs. poor inequities, and the hopelessness that can accompany them, are poisonous to democracy. In the final analysis they are likely to be every bit as destructive, if not more so, than large budget deficits. Nearly 15 percent of the population — including an estimated 15 million children — live below the federal poverty line, which is about $22,500 a year for a household of four. "Research shows that, on average, families need an income of about twice that level to cover basic expenses," according to the National Center for Children in Poverty, of the Mailman School of Public Health, Columbia University. A nation that looks to tax cuts and budget slashing as the answer to 44 million living in deep poverty — many with little hope of overcoming it — is either deluded or uncaring. Neither of those terms represents the America we know and love. We are a nation based on the principles of equality and opportunity. Let's live up to them by confronting the factors that lead to entrenched poverty. Promoting "personal responsibility" is an important key to this challenge. But so is government, which can help communities get through the worst of times and build better foundations for the future. Economic growth that provides jobs for unemployed and underemployed Americans is vital. But we must not pretend that poverty can be reduced by putting government on a starvation diet. The issue of poverty belongs at the center of the nation's political priorities, not at the fringe. Smiley and West raised its profile. Their bus tour has ended, but we hope that a new era of understanding has begun.